It has been a while since I tried a pound cake recipe. They are just so hard to get right. But this did look like a pretty nice cake, so I thought I would try my hand at baking it. Well, the flavour was pretty good, but the cake was a bit on the dry side, so I would highly recommend eating it with a cold glass of milk. I reduced the amount of sugar as we are not fans of really-sweet cakes, and used a really good cocoa powder so that the chocolate flavour really came through. I started by sifting the cocoa powder into a heat-proof bowl. Into this, I added hot (but not boiling) cream, and mixed until I got a paste. In a mixing bowl, I creamed the butter and sugar until the mixture was light and fluffy. The cocoa paste was added, and the mixture was beaten until it became smooth. The eggs were then added one at a time, and beaten before the vanilla extract was added, and beaten too. The last ingredient to be added was the flour. I added that in 3 parts and beat to incorporate. Finally, the batter was transferred into a lined and greased 9x5-inch loaf pan. It is a quick and easy cake to make for breakfast. 3. Combine the flour, baking soda and salt in a medium mixing bowl. 4. Combine the butter and sugar in a large mixing bowl and cream with an electric mixer on medium high speed until fluffy, about 3 minutes, scraping down the sides of the bowl once or twice as necessary. Beat in the cocoa powder paste until smooth. 5. With the mixer on medium low speed, add the eggs, one at a time, scarping down the sides of the bowl after each addition. Stir in the vanilla. 6. Turn the mixer to low speed and add the flour mixture, 1/2 cup at a time, scraping down the sides of he bowl after each addition. After the last addition, mix for 30 seconds on medium speed. 7. Scrape the batter into the prepared pan and smooth the top with a rubber spatula. Bake the cake until it is firm to the touch and a toothpick inserted in the center comes out clean, about 1 hour and 10 minutes. (I baked mine for 50 minutes.) Let the cake cool in the pan for 5 minutes, invert it onto a wire rack, and then turn it right side up on a rack to cool completely. Slice and serve. 8. Store uneaten cake in a cake keeper or wrap in plastic and store at room temperature for up to 3 days. 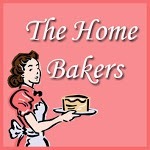 I am submitting this post for Bake-Along #51 hosted by Joyce from Kitchen Flavours, Lena from Frozen Wings and Zoe from Bake For Happy Kids. Your cake bakes up beautifully. Most of the reviews find this cake a little dry but very tasty. A glass of milk would indeed be perfect with this cake. Hey Joyce, actually after I tasted the cake, I went to read all your verdicts! I was so glad mine was not the only dry one!! Haha :) Thanks for hosting! Chocolate cake for your breakfast! Nice! hi diana, yes, mine was a little dry too but the second time came out much more better :) eating dry cakes can be unpleasant..haha..having a glass of milk along definately helps to ease the throat :D thanks for baking with us!